WORKERS who face potentially dangerous situations deserve the best protection available. At MSA, we work tirelessly to build smarter, better gas detection instruments that people across the world rely on. First we introduced MSA's advanced technology with the ALTAIR 4X Multigas Detector with XCell Sensors. Now we're proud to introduce the expansion of the most advanced technology available in any portable gas detector on the market: The ALTAIR 5X Multigas Detector with XCell Sensor Technology and PID option. 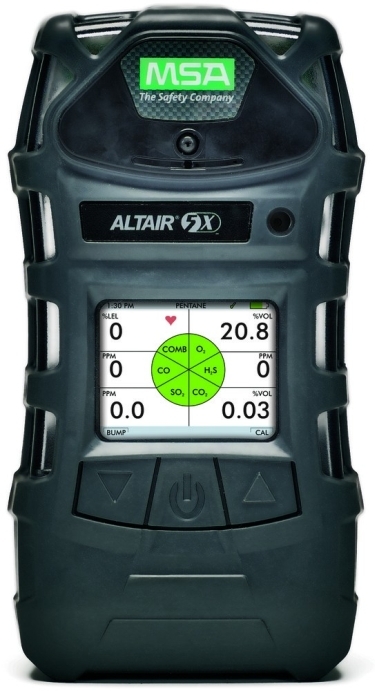 Built on Durability - The ALTAIR 5X Multigas Detector for combustible gases in % LEL and/or % volume range, O. and toxic gas detection is as tough and functional as it looks. A rugged, rubberized polycarbonate housing provides unsurpassed durability, including the ability to survive a 3-meter drop. Inside, a field-proven integral pump provides consistent gas flow without the problems of externallyattached components. Ergonomic design, glove-friendly buttons and high-contrast display make the ALTAIR 5X Multigas Detector easy to use for all applications.